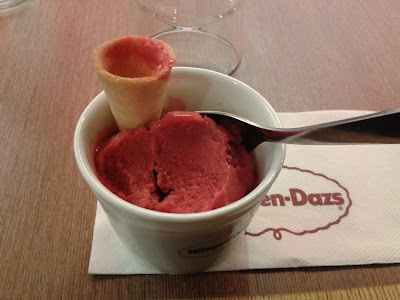 There are a few things to do if you find yourself in an ice-cream shop with a group of others. One is to sit in the corner with your arms folded. The other is to order a sorbet and join in the fun! Sorbet is basically a frozen dessert alternative to ice-cream. It's made with sweetened water flavoured with fruit (juice or purée). You'll want to avoid the chocolate sorbet as it contains egg-whites. Haagen-Dazs has over 650 shops in 54 countries across the world so, for the folks in Nigeria, it probably won't be long before it makes its way over there. If you really can't wait, then I have a great sorbet recipe coming up soon.